Bernie Hoffman looked like he was snoozing with his headphones on his ears Friday afternoon, but his tapping foot showed he was absorbed in the music. Hoffman, 91, is a resident at Mount View Care Center, and is living with the effects of Parkinson's disease, a stroke and dementia. The headphones were attached to an iPod that was loaded with his favorite music from his youth — polkas, waltzes and big band jazz. Every once in a while, a smile crossed his face. Mount View Care Center is one of 100 Wisconsin nursing homes selected earlier this year to participate in the Wisconsin Music & Memory Initiative. It's a state Department of Health Services program that funds training and equipment to provide residents such as Hoffman with digital music players. The Music & Memory Initiative is a nonprofit organization that was founded in 2010 with a mission to bring personalized music into the lives of elderly or infirm, particularly people with dementia. Fifteen residents of Mount View are participating in the program. Staff members try to set up residents with the music at least once a day, and have been recording the impact. Residents in the program have been taking fewer pain medications, fewer anti-depressants and anti-anxiety meds and are calmer since they've gotten their music,according to staff members. The music has even gotten them to talk more, evoking memories. North Central Health Care's certified music therapist Melissa Stockwell leads the initiative. She knows the power of music, but she said even she is astounded by the initiative's results. "When I was first approached with this initiative, I was leery. I said, 'We can do it, but this isn't music therapy,'" Stockwell said. Music therapy is usually done with live music, has specific goals and includes physical movement or actual playing of instruments. 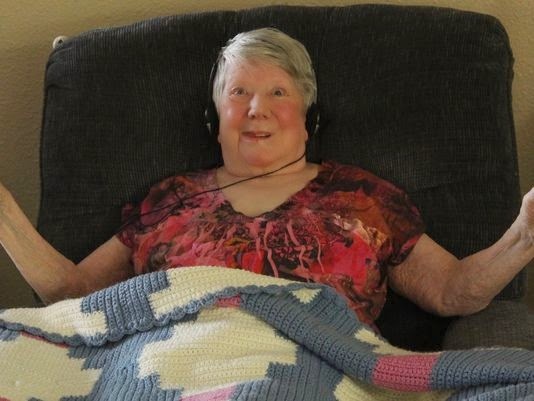 Stockwell said she didn't know how just listening to music would affect people with dementia. She said she can't say exactly why it works, but she has her theories. "Music is very engaging. It affects the entire brain. ... I think it creates a diversion from the pain, or what's going on around them," Hoffman said. "Music is medicine." Music always was a part of Hoffman's life, said Russ Hoffman, 63, of Rothschild, Bernie Hoffman's son. "He had a musical family ... and Dad played banjo and guitar," Russ Hoffman said. "Music was big." Russ Hoffman helped pick out the music that was programmed into the elder Hoffman's iPod. He knows that his father loves the music. "He couldn't tell you what day today is, but he can tell you the name of a band," Russ Hoffman said. The Mount View Care Center is seeking donations to expand its Music & Memory program. People can donate Apple music players or iTunes gift certificates. For more information, people may call Melissa Stockwell, music therapist, at 715-841-5104.